One of the core missions of any church is to curate and create worship that allows for personal spiritual growth and transformation. 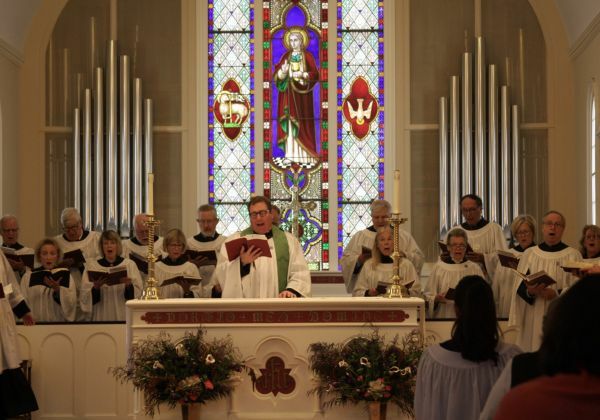 A key component and partner in that work, especially at St. John’s, is beautiful music offered both by our choirs and our congregation. In my time away this summer I collaborated with Nicholas White, a friend, and composer, on ways we might create even more beautiful simple worship in Morning Prayer. Nick then accepted a commission to write for us a set of suffrages and responses based on the hymn tune Grosser Gott. Nick will be with us this Sunday, Stewardship Commitment Sunday, to share his compositional offering with us and to premiere the work together. I hope that this simple and beautiful addition to our Morning Prayer tradition will become a valued part of our worship together and I hope you will join us for its premiere this Sunday.